Hitachi is seeking billions of pounds from the British government to help build a new nuclear power plant at Anglesey in Wales – but experts say the technology being used is far from proven. Last week Hitachi-rival Toshiba confirmed that they are pulling out of a major nuclear power project in the USA which planned to use a similar reactor type to the one planned for Wylfa. Toshiba said in a press release that the South Texas Project had “ceased to be financially viable” due to prevailing economic conditions. The announcement leaves the UK as one of the last countries looking to build this technology, called the Advanced Boiling Water Reactor (ABWR). Steve Thomas, Professor of Energy Policy at the University of Greenwich, said that while there are some small differences between the European reactor led by Hitachi and the abandoned US reactor from Toshiba, the “perception that this is proven technology is not supported by the facts”. Although there are four similar reactors that have been built in Japan, plans for construction elsewhere have seen a series of failures. A principal argument for nuclear power relates to the large amount of time reactors can generate electricity over a given period, as opposed to the time they are offline because of maintenance or malfunction. This is described as the ‘load factor’ – the technical term for the proportion of power generated over a year, and an industry shorthand for reliability – and the sector often cites 80-90% as an average figure. This is why nuclear reactors are seen as a reliable source of electricity. 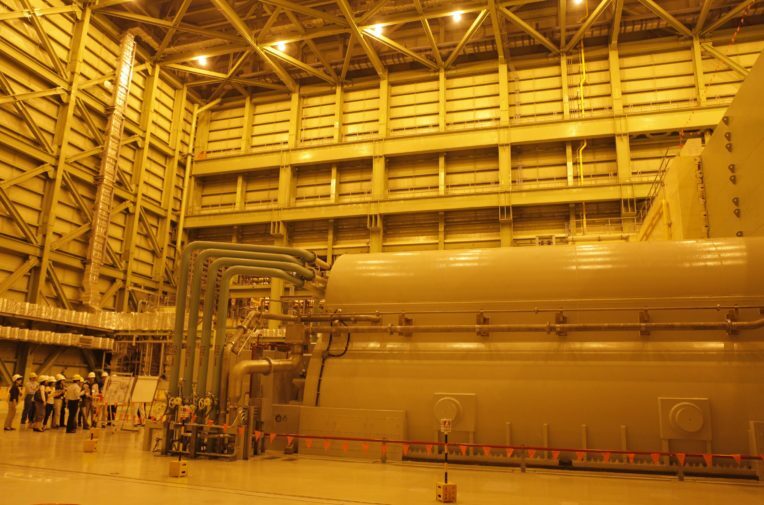 But the four Japanese reactors fall short of this standard, as the amount of power they have been able to generate over a year has fallen dramatically across their lifespan. The most recently constructed reactors are the Hamaoka 5 and Shika 2, which both have a lifetime load factor of around 45% over less than 10 years — and that’s before they were taken offline due to Fukushima. This means that over each’s operating life, they’ve generated under half of the power they could have. Part of this is due to Japan’s vulnerability to earthquakes, which can cause automatic shutdowns of nuclear power plants. After the Fukushima disaster, for nearly two years between 2013 and 2015, Japan had no nuclear reactors running at all. To come back online, all Japanese reactors now have to pass new safety tests in order to be allowed to operate. But some of the Japanese ABWR reactor’s unreliability came from engineering issues. In 2005 and 2006, both Hamaoka 5 and Shika 2 were found to have turbine failures which meant they were closed for lengthy periods. Following the tighter post-Fukushima regulations, it’s not clear whether either reactor will ever come back online. The two other reactors, part of the Kashiwazaki-Kariwa nuclear power plant, were built in the mid-90s. They have not operated since 2012 and 2013 respectively and were shut down for a spell following the Chuetsu earthquake of 2007. Prior to these forced shutdowns, they performed relatively well – with a lifetime load factor of around 70%. However, ongoing lawsuits are challenging the operation of these ABWRs, and the others in Japan, over alleged design safety issues that make them vulnerable to accident. In Hitachi’s presentations around the ABWR to be used at Wylfa, it’s not clear how these historic reliability issues are to be addressed in the UK. Last week’s announcement by Toshiba to walk away from its South Texas project is the most recent ABWR construction failure outside of Japan. Toshiba agreed to make two reactors in 2008 but fell into licensing difficulties, and the US utilities company working with them wrote off $331m worth of investment in 2011 due to regulatory uncertainties following Fukushima. Toshiba had been funding the licensing processes and searching for investors ever since. Similarly, an ABWR project in Taiwan has been dragged down by complications. Begun in 1999, a first reactor was due to enter commercial operation in 2006 and a second in 2007 – but contractual disagreements and wavering political support caused delays and cost overruns. The project was finally mothballed in 2014. Back in Japan there are still two ABWR units in construction, but both of these have been beset with years of construction delays. Largely complicated by Fukushima, operation of Ohma nuclear power station has been moved from 2012 originally to at least 2023, while the other, Shimane 3,was due to begin operating in 2011 and inspections for a restart to development are still underway. While not all of the difficulties building these power stations reflect specific issues with the ABWR itself, they do mirror the enormous financial and technical struggles of building a reliable nuclear power plant. In the press release announcing its South Texas decision, Toshiba reiterated that “no investors have expressed an interest in participation, even though the project has received combined licenses” from the US authorities. “In these circumstances, there is no clear pathway to securing profitability,” they added.